Remington Can Be Sued By Sandy Hook Victims, State Supreme Court Rules Gun companies have rarely been held liable for crimes committed with their products. This lawsuit could mark a new front in the battle over gun regulations and corporate accountability. 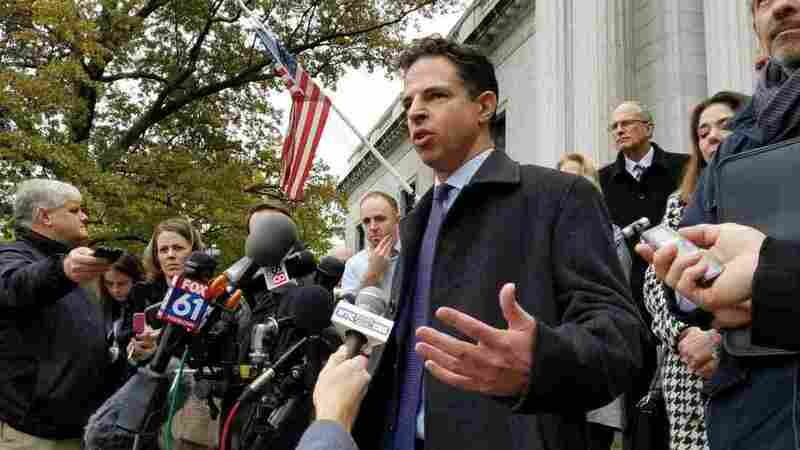 Josh Koskoff, a lawyer representing the families of Sandy Hook shooting victims, speaks outside the Connecticut Supreme Court in this file photo from 2017. The suit is a high-stakes challenge to gun companies, which have rarely been held liable for crimes committed with their products, and could mark a new front in the battle over gun regulations and corporate accountability. It centers on the Protection of Lawful Commerce in Arms Act (PLCAA), a 2005 law that shields manufacturers and retailers from civil liability in lawsuits brought by victims of gun violence. An eventual ruling against Remington could establish legal precedent, opening doors for more lawsuits against gun manufacturers, and expose the company's communications about its marketing plans. The 4-3 majority largely upheld arguments made by lawyers for Remington that the company is protected from suit in many instances. The court ruled, however, that Congress did not intend the PLCAA to preclude state law. Ultimately, the majority said, the plaintiffs should have the opportunity to prove that Remington violated the Connecticut Unfair Trade Practices Act (CUTPA) by marketing a military-style weapon to civilians. A Connecticut Superior Court judge dismissed the lawsuit in 2016, agreeing with lawyers for Remington that the case falls within the "broad immunity" gun manufacturers and sellers are afforded under the PLCAA. The state Supreme Court decision, however, paves the way for the suit to continue and for lawyers to access internal documents from the firearms companies. The lawsuit was originally filed in 2014 by nine families of the victims in Sandy Hook and a teacher who was injured in the shooting. It names gun manufacturers and distributors Bushmaster, Remington, Camfour Holdings LLP, as well as Riverview Gun Sales Inc., the gun shop where the shooter's mother purchased the Bushmaster AR-15 rifle, and the store's owner. "I can't say I'm excited by this ruling," said Ian Hockley, whose 6-year-old son was killed at Sandy Hook Elementary. "I wish it was never here. But what we've said from the outset is all we want is our day in court, for the law to be upheld and for a jury to decide our case." Guns & America is a public media reporting project on the role of guns in American life. Guns & America's Lisa Dunn and Jeremy Bernfeld contributed to this report.